Teenager caught blowing up Windsor mailbox with firework. A Santa Rosa teenager was caught blowing up a Windsor mailbox with a firework last night. Deputies received the call around 9:00 PM. A homeowner in the 9800 block of Old Camp Ln called Sheriff’s Dispatch reporting that someone just blew up his mailbox. Deputies responded and the witness told them he heard a loud explosion and ran outside to see a white Dodge pickup making u-turns in the area. The caller was also able to give deputies a partial license plate. A second deputy checking the area found the white Dodge pickup near Mark West Station and Starr Rd. The deputy made a traffic stop and contacted an 18-year-old male driver, and a 17-year-old male passenger. Upon questioning, the 17-year-old became very cooperative and accepted total blame for the incident. He told deputies he had acquired a firework in Nevada last week and brought it home. He described it as a mortar, roughly 4-6 inches long and 3 inches in diameter. While they were driving around, the teen passenger told the driver to pull over and he did. The passenger got out of the truck, lit the firework, and threw it in the mailbox. They then drove off, making several u-turns and watched it blow up. The teen was very apologetic and offered to pay for the mailbox. Deputies from the Sheriff’s bomb squad were called to the scene. 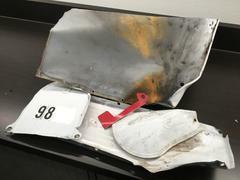 They examined the blown-up mailbox and found that the damage was consistent of that from a firework as they teenager stated. Deputies called the suspect’s father to the scene who took custody of him as he was released on a citation for vandalism. The suspect’s name is not being released as he is a minor.